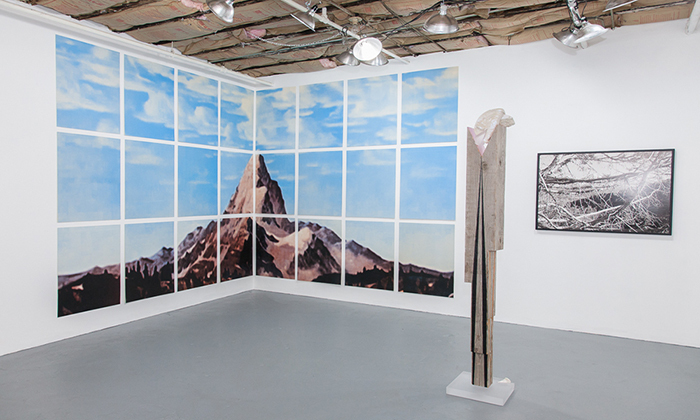 Black Ball Projects is pleased to announced MTN, a four person show revolving around a single idea: mountain. Literally and figuratively, the mountain is a place where we act out our mythologies. Either as a symbol or as an actual place, it often serves as that distant frontier and a stark contrast from the civilized lowlands. Our heroes run there to start anew, seeking glory or redemption while our villains may too reside there building strength in war-torn mountain caves. In that respect, the mountain can also be a place of suspicion and a site of unknown horrors. This invokes notions of the romantic and the sublime laid out by 18th century British and German philosophers (often drawing upon mountain filled nature), which is still an effective philosophical lens by which beauty, experience, and aspects of the known and the unknown can be viewed. The work in this show, a collection of photography, printmaking, drawing and sculpture, each use the mountain as a subject of play, creating unique viewpoints of how this mystique can be generated and/or subverted. totally other isn't enough to make it real. In fact all belief can do is lend itself to the fabrication of the subject's antithesis - the intrinsic. So we have that, at least, in the end. This situation persists because we cannot apprehend the horizon and its far side simultaneously, and the horizon always retreats at the pace of our approach. We will forever remain the exact distance to alien from where we were at the moment we first became attracted to the notion, because it is an unobservable one, obscured behind the sliding mountains. Discard the word alien, it is a figment. It is a fiction whose time never/always arrives, for when it does it is instantaneously folded into the known. It is a concept without reference, an infinite tower of trap-doors. The alien is leached of its un- qualities so fast that it becomes immediate family. The alien sits outside the comparable. The shadows of the mountain site our magical experiments, beautifully doomed attempts to transcend. And from the peaks we do manage to summit we will always only spy the next range, beyond which there be the alien. This series of drawings short text based drawings is an off-shoot I began work on several years ago. The text is taken from sentence fragments of short stories from The New Yorker, that evolved into a font of my design. I produce a monthly noise and experimental music showcase, the posters that promote these shows highlight this font and drawing style. For this exhibition, organized around the theme of “mountain” the drawings are a hybrid of these two, drawn in the same way using the same font, but framed and hung in an inverted triangle, the fragments fight to become one message, but they are disparate and remain separate. In some manner they stay connected to music and the sort of broader simplified symbolism of early folk melodies, ie: mountains songs, taken from american folk and spiritual songs. They are lyrics from songs we all have heard but don’t know where from or who sang them. They are all black drawings and the straightforward framing enhance the somberness of the selected words.